Optima will be presenting innovations at Interpack 2017 under the motto ‘Mission Total Care’. New HMI technologies, software tools and sensor technology signal the start of a future era of highly efficient packaging processes and comprehensive lifecycle management. This can be experienced by taking a futuristic journey using a multimedia shuttle at the booth. Optima will also feature new machine solutions, turnkey systems and ‘Project ZERO’ (Hall 16, Booth No. F25, F26). Soon customers will have the choice: Which HMI hardware to work with? How should the HMI be adapted to the specific needs of the user? We have in store a radical technical change in hardware and functionality that will increase the efficiency in system operation. Thanks to smartphones and tablets, today’s users are accustomed to intuitive and clearly arranged interfaces for operating devices. New HMIs take up these developments, but are adapted to the industrial environment and expanded with essential features. Optima is presenting a genuine pioneering feat with its ‘Project ZERO’. The technology of the future is ringing in a new era of production flexibility. This machine perfectly adapts to the requirements with optimized format change time, a new stacker for feminine care products and a platform with a completely modular design. The operator specifies designs and data, the machine handles the rest. The different packagings are produced inline. Furthermore, new sensor technology leads to process stability that is once again significantly increased. Project ZERO is forward-looking. Optima Consumer offers everything from entry-level solutions to high-end machines and turnkey solutions, also for coffee capsules. The new OPTIMA CFR is compact, efficient and flexible. Made for market entry in proven OPTIMA quality. The rotary machine, pre-configured for compatible capsules, can be ordered with our new Starter-Kit. The key advantage of the Starter-Kit is that production can begin immediately, resulting in a short time-to-market. Complete high-performance production lines for beverage capsules: Optima offers everything from its own portfolio, from taking packaging material off of their shipping pallets to putting packaged finish products back on pallets in shipping cartons. 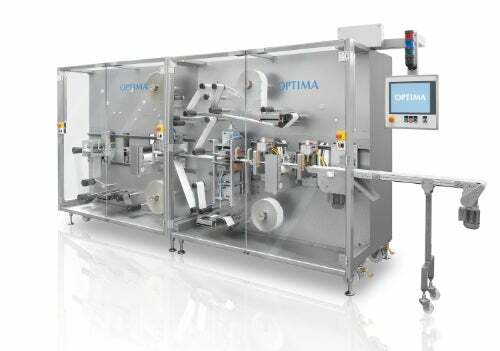 This makes Optima the only manufacturer of complete lines for beverage capsules. The production machines and machines used for cartoning coffee capsules displayed at Interpack are at the core of the production line for a capacity of 400 capsules per minute. The performance spectrum of the Optima systems can reach more than 1,000 capsules per minute. Flexible top loading technology also makes it possible to use common setting patterns in the cartons. The shown OPTIMA Moduline is equipped with a Laminar Flow in order to comply with the high hygienic requirements in the cosmetic industry. The two-phase dosing module fills the liquid and non-miscible phases of the product in separate containers. In addition, the 6-headed filling unit can be operated in a conventional manner. In combination with the precise torque capper, an output of up to 120pcs/min. can be reached. The OPTIMA FM1 for liquid to pasty products is ideal for the food, cosmetics and chemical industries. Two different pump systems ensure a wide range of applications, high filling accuracy and very gentle product handling. The OPTIMA FM1 processes a filling volume capacity of up to 1,000ml, at a maximum output of 90 containers/min. The OPTIMA CM1 pairs perfectly with the FM1 in terms of closing technology, with the flexibility to be configured or expanded for a range of closure types. Installation, format change and operation via the HMI is quick and easy. The entry-level machines are built in serial production, to minimise lead-time while maintaining the highest quality standards. The Optima pharma INOVA VFVM 18000 is a machine designed for high-performance processing of vials and infusion bottles. Up to 24,000 objects per hour are filled and sealed. The system features a broad format range from 2R to 500IL (fill volume of 0.1ml to 500ml). Specific dosing technologies are used depending on the product features, including disposable systems. Optionally, the INOVA VFVM 18000 can be used with washing machines, sterilisation tunnels, isolators and in combination with other containment and loading systems, as well as freeze-drying systems. The modular, flexible INOVA SV125 machine system can be operated with three different filling systems and can process three different container types: nested syringes, carpules and vials. The INOVA SV is suitable for the range from pilot testing to medium outputs. A maximum output of 18,000 containers / hour is achieved via ten filling stations. The dosing range is 0.1ml to 50ml. Numerous supplementary modules, functions and containment technologies are available, including isolators. Ideal for new products and business areas: the OPTIMA TDC 125 from Optima Life Science can produce all current transdermal patches (TDS) and oral film strips (ODF) at a laboratory scale or in small production batches. All the production and packaging processes can be validated before being transferred to larger production machines if required. The scalable machine is suitable for manufacturing product samples for clinical tests, for market launch and even for subsequent production. In its simplest form, the system features intermittent operation. Alternatively, the system can be operated continuously with a high output for production of larger volumes. With the OPTIMA ImmuCoat® system, Optima Life Science shows a modular and scalable system for automatic coating of micro-titer plates for the manufacture of ELISA test-kits. The special feature: All basic modules can be combined as desired. Equipped with a ‘plug and play’ architecture, the basic modules can be connected together in the simplest way. Almost any product batches can be managed simultaneously and processed without the risk of mix-ups. Optima will be at Interpack 2017 (Dusseldorf), 4-10 May 2017, in Hall 16, Booth No F25, F26.